Children are, contrary to appearances, extremely demanding customers, in which tastes are not easy to fit. For this reason, a room for a toddler is often a challenge for parents. Choosing furniture and accessories should be guided by several important aspects - functionality, safety, as well as the interests of our child. One of the most important elements in the child's room is lighting, which has a huge impact on the mood in the room. Every child in his room spends a lot of time. He often stays in it from morning to evening, so it is important that the interior is well lit all day long. From the morning to the early afternoon, we have a problem with our heads, because at this hour there is access to natural light, but when it's dark, it's necessary to use artificial lighting. The central point of each room are hanging lamps for children, which illuminate the whole room. They are perfect during the evening play, because they make every element of the interior is perfectly visible. Hanging lamps for children's room - how to choose them? Choosing lighting for a children's room is not an easy task, because a suitable pendant lamp should meet several important criteria. One of them is the intensity of lighting - better light will be better for more precise activities. You should also pay attention to the age of the child. The right light for babies is one that does not hurt your eyes. The room should be dark, which provides a comfortable sleep for the child. The lighting color is also an important factor. Light with a warm shade favors rest, and the cool color will make the child excited for action, which is why our choice of hanging lamp should fall on the one that gives a warm light. Children love when there is a lot going on around them. Colorful shapes and fairy-tale characters are something that will surely attract their attention. When choosing a ceiling lamp for a child's room, we should take into account colorful and interesting models that will stimulate the imagination of our child. It is also worth considering what your child is interested in and what he likes to do in his free time. In this way, choosing the right lamp will be much easier. 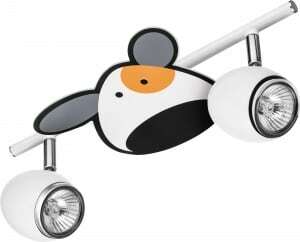 For boys, the ideal pattern will be lamps in the shape of a favorite toy, such as a car or plane. The girls will be interested in lighting with the theme of princesses or fairy-tale animals. 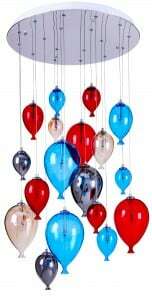 A universal pattern that catches the attention of every toddler is hanging colorful balloons. The choice of hanging lamps for the children's room is really big, that's why every little person will find the perfect model for themselves. If you are a parent, you certainly want your child to be brought up in a warm and cozy atmosphere. The decor of a toddler's room is an extremely important issue because it is in this room that the youngest spend the most time. Take care of the good lighting of the children's room, which will not only be functional, but will also have a positive impact on your child's development and imagination.